Review Article: The Death of Christian Britain Reconsidered. 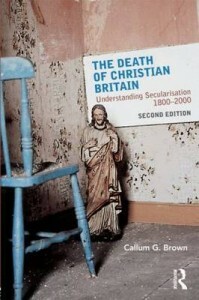 Callum Brown, The Death of Christian Britain, Understanding secularisation 1800-2000, 2nd edition. London: Routledge, 2009. IBSN 13: 978-0-415-74134-3. 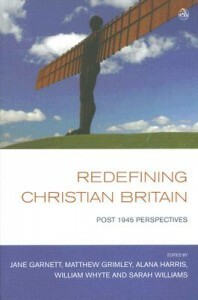 Jane Garnett et al., eds., Redefining Christian Britain: Post-1945 Perspectives. London: SCM Press, 2007. ISBN 978-0-334-04092-7. Keith Robbins, England, Ireland, Scotland, Wales. 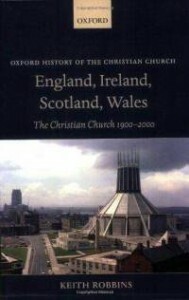 The Christian Church 1900-2000. Oxford University Press, 2008. ISBN 978-0-19-826371-5. The impact of these challenging views was only made more strident by his claim that this ‘death’ could be precisely dated to the 1960s, i.e. had already happened, and by his assertion that the principal cause lay in the decision-making of young women. Their abandonment of the habits and thought-forms of their mothers and grandmothers, who had for so long sustained both the moral forms and the institutional life of the churches, was the key factor. In the remarkably short period of the 1960s all this was to be eroded. It was a sudden and drastic process which Brown described as the de-pietisation of femininity and the de-feminisation of piety. These provocative assertions were part of his sub-title’s Understanding Secularisation 1800-2000. But secularisation is both a complex as well as an emotive term. There have been at least two rival and opposed assessments. On the one hand, almost all church-goers including the professional clergy and their supporters, have deplored the loss of faith, the decline in church attendance, the erosion of social and personal values, and the abandonment of the so-called Christian identity of the nation. These developments were often associated with the growth or urbanisation and modernisation so that the myth of ‘the unholy city’ with its dark satanic mills could be contrasted with the simple purity of rural life centred around the parish church or chapel on the village green. On the other side, the champions of secularisation saw this as a revolutionary advance into the modern age, when the individual is liberated from superstition or the shackles of clericalism. Secularisation is a salute to reason, to intellect and to progress. By the mid-twentieth century, virtually all British intellectuals subscribed to this ideology. Yet it took the impetus of a social revolution in the 1960s, which freed British popular culture from what Brown believes was the misery of a restrictive Christian discourse, often backed by the state. For at least a century this discourse had governed all aspects of self-identity and expression, community-regulated leisure and domestic life. Its repressive features, in the name of adherence of Christian morality, had imposed great suffering on minorities and miscreants, such as homosexuals. It had strictly limited the range of opportunities especially for women. It was the rejection of these bulwarks of Christian piety, so Brown believes, which so rapidly led to the death of this kind of Christian culture in Britain. Brown’s critics were quick to attack him for his reductionism and for his mono-causal explanation for the demise of the Christian discourse. But it is noteworthy that Brown also took issue with much of the methodology employed by many sociologists of religion. Particularly he disputed the widespread teleological theory whereby religious decline was seen as the inevitable and linear obverse of the rise of rationality and science. Brown disputed this time line by pointing to the undeniable revival of religious life in Britain in the immediate post-1945 years. So too he challenged the views taken by many left-wing social scientists who drew their analysis from Marxist theory. According to this paradigm, Christianity’s hold was largely class-based, and would and should disappear once the class struggle was overcome and modernisation ensued. But the subsequent discrediting of Marxism and its theories of modernisation now requires now requires new coherent explanations for the apparent changes in Britain’s religious adherence. Redefining Christian Britain. Post-1945 Perspectives is the product of an Oxford conference whose contributors sought to escape from the ideologically-based theories or the sociologically-based statistics of the proponents of secularisation. Instead they sought to stress Christianity’s continuing influence on culture through literature, art and architecture. As well, they found Christian moral ideas as forming the background for many economic developments, as well as in protest movements. Above all they seek to claim the continued relevance of Christian values in Britain’s national identity. Christian Britain is not dead, they assert. There is no corpse in the Library. Rather, these essays contain countless examples of how Christianity has continued to infuse public culture, though the authors admit that the cultural strength of religion must be separated from its institutional strength or decline. By rejecting any teleological approach, they argue for a wide variety of positive adjustments in British religious life, pointing particularly to the number of sub-cultures brought in by recent immigrants. There is considerable mention of “transformations” in the chapters of this book. Many of the contributors rightly point out that the 1960s were indeed years of change and challenge in Britain. The national identity, and with it the many religious associations it held, were transformed in more ways than allowed by Callum Brown. The loss of empire, the spectre of nuclear annihilation, the awareness of world poverty, and the wholly new relationship with Europe, all posed questions which included a religious dimension. Above all, these were years in which religious certainty faded, to be replaced by a far more questioning discourse. It was not surprising that Bishop John Robinson’s Honest to God should prove to be the best-selling theological work of the century. The abandonment of the ideal of authority, and the disappearance of a deferential society, both clearly affected the position of the clergy. So too the rise in the general standards of education meant that many more individuals than before claimed an independence of mind which no longer looked for paternalistic guidance from the churches or their ministers. There was in fact a process of spiritual fragmentation when the institutional church, with its rituals and dogmas, no longer received automatic assent. This development proved to be far more corrosive of belief patterns than the alleged impetus of women’s sexual liberation. There were indeed, as Mark Chapman points out, many churchmen who welcomed a transformation of their spirituality, and who looked for more relevant forms of Christian witness, stripped of the Victorian trappings of religion. Some were to welcome the abandonment of dogmatic theologizing, and were to cultivate a vaguer religion of love and service of fellow men and women. But others still recognized the need to maintain the importance of the transcendent in both personal and public life. They were to argue that the churches should continue to have a prophetic and critical role over against all idealistic political or social proposals. If the churches limited themselves to being agents of social reform, they would have lost a dimension of incomparable worth. Transformation should be achieved without sacrificing the essence of the Judaeo-Christian heritage. And institutional diminution was not necessarily a pointer to social relevance. In the view of these authors, the wishful thinking of doomsayers, predicting religious and moral decline, has to be challenged. Little evidence exists that the national standards of personal morality have declined, even when the churches’ previous emphasis on puritan-style sexual ethics has been overtaken. Instead, newer issues such as nuclear armaments, climate change, or world poverty are clearly able to arouse strong moral reactions, derived certainly from Christian roots. The discursive Christianity of the British nation still continues in a variety of different ways. A transformed view of the sacred, and an ardent desire for genuine spiritual experience, still persists, even if bearing little resemblance to the master-narrative of former years. The authors’ conclusion is that Christianity in Britain has been better able to respond to changed circumstances than grand narratives of decline or death have allowed. The picture they uncover is one of innovation and exploration not of atrophy or paralysis. In short they believe that Christian Britain is not dead but that it will continue to be reshaped and redefined in the years ahead. How Christianity interacted with broader social and political movements in the twentieth century is the focus of Keith Robbins’ magisterial study of the Christian Church in the four countries which form part of the British Isles. Robbins is a distinguished scholar of church history, and a former university president. He is very much aware that England,Scotland,Wales and Ireland all have a long history of dialogue between Christianity and its surrounding culture. The varieties and the peculiarities of this relationship lie at the heart of his book. Christianity has been embedded in Britain for over sixteen hundred years, during which it has been shaped by numerous, frequently conflicting impulses. The dialectic between past and present has produced radically different situations and seemingly incompatible belief-systems. Yet Robbins seeks to write transnationally and transdenominationally since he believes he can see the unity in this diversity. This is no ordinary textbook. The reader should be warned not to expect any systematic delivery of names, dates, places or statistics. Instead, it is a large-scale portrait, or rather a series of large-scale portraits in chronological order, bringing in aspects from each of the national church settings. Robbins paints with a variety of multi-coloured brush strokes, each drawn from his immense fund of knowledge and reading. His style is allusive, following in the footsteps of G.M. Young and Owen Chadwick. Readers are therefore expected to have considerable knowledge already in order to appreciate his nicely-pointed comments. Robbins naturally takes issue with Callum Brown`s over-simplistic assessment. Rather, he believes, the churches have always lived in an ambiguous and often awkward symbiosis with their environment. The issue is how this relationship can be fully described given the complexity of the churches’ institutional life and the variety of ways in which the different sections of the population both contribute to and are drawn from the church communities. A ‘typical’ church, he believes, is elusive, but he seeks to integrate, in a comprehensive and ecumenical whole, the various strands, both from within and outside, as well as from above and below. His task has been complicated by the fact that most church histories have been written from the perspective of one or other denomination to confirm their legitimacy and authority, and to impugn the claims of others. Robbins seeks to rise above this fray and adopts an even-handed ecumenism. He is ready to understand, though not necessarily to endorse, those viewpoints which he sees as narrowing down the Christian message because of a particular theological or social slant. All have, he believes, to be accommodated as part of Christian Britain, even when discordantly opposed to each other, as for example in twentieth-century Ireland. So his volume is irenic and suitably comprehensive, and his wide-ranging sympathies can open new horizons of insight. For the first half of the century, the question of how the churches related to concepts of Britain’s national identity and to its military and political fortunes was a constant preoccupation. In England the established church had little debate about where its duty lay, but increasingly more about the ethical values such nationalism propagated. In Ireland, the Catholic faith had no such priority. It saw itself as the church of the victimized population, creating barriers against unwanted and alien onslaughts. But both sides saw their stance as upholding their Christian witness. The bitter divisions in doctrine and practice which had accrued since the Reformation still prevented unity. But increasingly all churches faced parallel challenges confronting what came to be known as the tide of secularisation. Yet in 1914 all the churches in England,Wales and Scotland, and in some parts of Ireland, especially the north, enthusiastically backed the war effort including its appeal to nationalism, militarism, even jingoism. Only a tiny handful saw pacifism as the true Christian discipleship. But the subsequent mass slaughter on the battlefields thereafter was to cause a major and irreversible crisis in the credibility of the Christian witness and to lead to long-lasting disillusionment with its institutions and personnel – and not only in Britain. To many observers, myself included, this post-war disenchantment marked the onset of the death of Christian Britain. But Robbins rightly points out that the churches were too closely integrated into their host societies to be able to develop alternative theologies or practices. The clergy particularly could not escape the role of being public cheerleaders for the war effort. But the price was fateful. During the Second World War, most church leaders were more cautious. Bishop George Bell urged the government to ensure that the war was waged in a Christian fashion on behalf of the Universal Christian Church, and not just for the advance of national interests. The Pope, in the impartiality of the Vatican, upheld the cause of peace, despite being under relentless pressure to join one side or the other. No German church leader ever opposed the regime or its wars of racial annihilation. Attempts to justify such events as Auschwitz or Hiroshima merely discredited those who tried. Such horrendous crimes only revealed the Christians’ impotence and their creeds’ irrelevance. But, as both Brown and Robbins show, in the post-1945 period, the desire to rebuild Britain on the basis of Christian family values brought about a revival in many denominations. The more critical questions were subdued or postponed. The churches existed in a widespread state of cognitive dissonance. Only in the 1960s did these issues become insistent. Many younger people, of both sexes, then found they could no longer support the supposedly hypocritical and compromised churches, which should be left to die out. Secular scepticism was more honest. There was, however, one part of the British Isles, in the last half of the century, where Christianity and the churches were of crucial significance, though hardly in any laudatory sense. Robbins’ treatment of the ‘troubles’ in Northern Ireland is brief but succinct. Undeniably, the situation in Ulster reinforced his main contentions. The province’s deep-seated religious factions and rivalries were inextricably interwoven in the political and social fabric. The conflicting religious traditions were not just a propagandistic cover for more vital economic or political struggles. Rather the intensely-held folk memories of each side’s religious traditions gave the conflict its enduring and intractable quality. Cromwell mattered. Even more significantly the conflict continued even though the church leaders on both sides came to deplore the violence and bloodshed. But they were not heard. The clergy’s authority was one of the casualties of this un-Christian fratricidal strife. All this was part of a wider process. In the latter part of the century authority figures in both church and state were rejected. As prosperity grew, so did the notion of self-help spirituality. Britain became a market-place for competing yet negotiating moralities. Many church leaders recognized that they had been improperly coercive in the past. And while the Pope still called for obedience in matters of personal, especially sexual, morality, he increasingly called in vain and could no longer seen as the voice of Christendom. The final years of the century were therefore years of institutional and ethical unsettlement. Questions were increasingly posed about the identity and viability of churches, but not severely enough to overthrow the historical divisions embedded since the Reformation. The failure of church unity plans meant that the churches remained rooted, for better or for worse, in their cultural inheritances. And their discordant voices meant that they lost more of their moral authority, along with their disappearing membership. Britons became much more pluralistic in their religious views and spiritual searching. Thus Robbins finds himself at least in partial agreement with the more guarded of Callum Brown’s assessments. “This was a period which witnessed the increasing marginalisation of religion from British public life, intellectualism and popular culture.” And yet, a wide survey conducted at the turn of the century found that 77% of the population reported themselves as having a religious affiliation, the majority of whom declared they were Christians. This was perhaps based on a diffuse understanding of what Christianity meant and entailed.. But it could indicate that the notion of the death of Christian Britain had been overstated. Christianity could still be regarded as a significant contributor to national life, even if its institutional expressions were fragile. The secular state cannot be regarded, in Robbins’ view, as the desirable terminal conclusion of two thousand years of Christian presence on Britain’s soil. The pluralistic spiritual patterns which currently prevail may yet hold out other possibilities.